I have to admit, yarn shopping takes a back seat when the alternatives include visiting Kinkaku-ji. 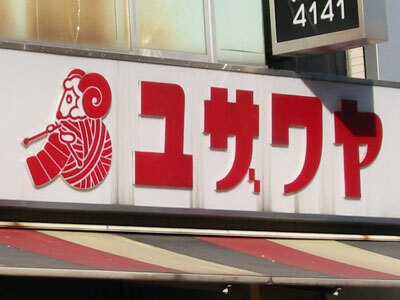 Yuzawaya isn’t so much a yarn shop as a craft department store. Japanese department stores are somewhat legendary for their size and the range of services they offer and Yuzawaya fit the bill. The basement was food, as is traditional for a depato. First floor was fabric and floral arranging. Yarn was on the second floor. Yarn, notions, spinning wheels, and knitting machines. And random breads and bake mixes. …and stop to ponder this pink crocheted bag. The pattern is free with purchase of yarn! What color shall I make the bag? Surely not this hideous yellow I am holding. Oh look! Wall of Noro! Most of the yarn in the store was sold by the bag and the Noro was no different. 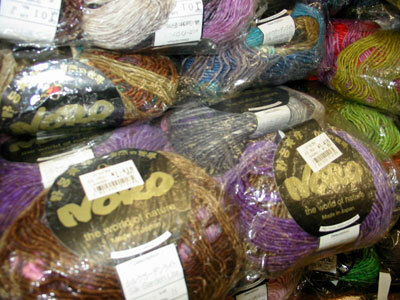 I try to think of a yarn shop in the US where I could walk in a buy a nicely-packed bag of Noro, instead of having to dig through a bin looking for matching dye lots. I encounter a British Sheep Breeds poster and am taken in by some kind of longwool. 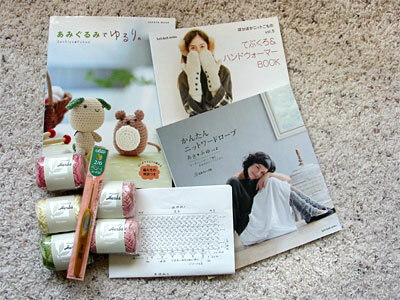 Clockwise from top left we have: an amigurumi book of crazy adorableness (of course), Tebukuro & Handowoma (gloves and handwarmers), Kantan Nitto-wadorobu (easy knit wardrobe), and the pattern and supplies for the pink crocheted bag I was looking at. I’ll probably post more in-depth commentary on each book, but I did notice that all three books are contain both knit and crochet, and the projects in the “Easy Knit Wardrobe” book are quite a bit more difficult than the average easy knits book in Barnes & Noble. I bet there are cultural differences in the exposure to, and the value of craft that are well worth exploring. Plus it will give me a chance to practice my Japanese! CogKnition posted this on November 19th, 2008 @ 1:05pm in Life as a Knitter, Yarn | Permalink to "Amimono!"